There are 340 days to go until the UK leaves the EU. The time remaining for the UK and EU to negotiate a withdrawal agreement is even less than that. Domestic legislation still needs to be passed to retain EU law in national law. Time will also be needed to give domestic legal effect to any withdrawal agreement. Time is short even to do what the UK Government wants to do, namely to leave the EU, its Single Market and Customs Union, and instead negotiate with the EU a new relationship based on a free trade agreement. And yet we still seem to be talking about alternative options. Indeed, the term “least worst Brexit” seems to be gaining some currency as politicians and others wake up to the reality of what the UK intends to give up from its EU membership as well as all the difficulties and limitations associated with what the UK Government aspires to achieve. A prime example of these attempts to temper the effects of Brexit is the idea of remaining in a customs union. The focal point for this debate is Parliament, with both the Lords and the Commons seeking to steer the Government towards a customs union. For the Commons, a debate will be held on Thursday on a motionthat calls on the Government ‘to include as an objective in negotiations on the future relationship between the UK and the EU the establishment of an effective customs union’ between the UK and the EU. It will be a debate with no immediate legal consequences and the reference to a ‘future relationship’ may look beyond the immediacy of current negotiations. The Lords, however, have gone further in amending the European Union (Withdrawal) Billto make the repeal of the European Communities Act 1972 conditional on Ministers laying before both Houses of Parliament a statement concerning the steps taken in negotiations under Article 50(2) to negotiate an arrangement to continue participating in a customs union with the EU. In response to these moves, the UK Government has today repeated its position that the UK will be leaving the customs union. So what should we make of attempts by Parliament to push for a least worst Brexit? The first thing to be clear about is that the UK Government is not negotiating in Brussels according to a mandate that Parliament has set for the UK Government in advance of negotiations. Our constitutional set up is instead one in which Parliament’s role is to legislate to implement international agreements and, in more recent times, to signal its approval of such agreements prior to ratification so as not to lead to the circumstance in which a Government is confronted with a Parliament unwilling to legislate for a deal that it does not like. We are now 15 months on from the Lancaster House speech in which the UK Government set out what sort of Brexit it wanted. We are also more than a year into the negotiations that will lead to the UK’s withdrawal from the EU with likely less than half a year left to finalise the deal. This hardly seems the moment for Parliament to decide it wants to instruct the UK Government on what it should be negotiating. Secondly, Parliament cannot simply legislate for a customs union. The UK is leaving the EU and any future relationship can only be negotiated between the UK Government and the EU. The Lords amendment to the Withdrawal Bill does recognise that in the sense that it only demands that Parliament is informed about those negotiations. As such it is also an amendment whose condition is easily satisfied. After all, ministers may simply state to Parliament that ministers have taken no steps to negotiate a customs union as it is not government policy to have one with the EU. Given that the Government is clear about what it wants, the only real option for Parliament is to bring the Government down one way or another. And if this Government is gone, are we really talking about forging a least worst Brexit or something else all together? Because if there is a strong enough political momentum to reject the Government’s Brexit strategy and to argue instead for a customs union and likely also the Single Market, then perhaps there is political momentum to push for retention of EU membership itself. 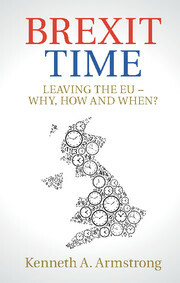 As I argued in Brexit Timeand as I have been suggesting here, Brexit is a choice in time and of time. In the time that remains before the UK leaves the EU, I think the choice is not between the UK Government’s form of Brexit and a least worse version. It is between what the Government is seeking or the UK remaining in the EU. So I have come to a conclusion. There should be a referendum on the question whether the UK leaves the EU on the terms that the UK Government negotiates, or the UK remains a Member State of the European Union. There is no time for a third way option and all the chatter that suggests that such an option might be viable is, to my mind, a distraction. I fully understand those that believe another referendum could be divisive. But to be clear this would be a referendum on a different proposition. And it seems to me that people on both sides of this argument need to have the courage of their convictions. Either the Government is right to push for an end to EU membership on the terms it negotiates, or it is wrong and the status quo should prevail. As I have also argued on this blog, if there is to be another referendum, time is limited. This is not the time for Parliament to try and find a middle ground. It is time for Parliament to allow the electorate to make a decisive choice. If Parliament wants to legislate for anything it should be to for a referendum. Previous Previous post: A Customs Union Without a Single Market : Is Corbyn’s Position Credible? Next Next post: Brexit’s Bitter Pill – How Significant Was the Government’s Defeat on the Trade Bill Amendment?